Differences between the map and Reality. 2> Trail just North of the Kerrick Ford modified as indicated on map. All of these route modifications are noted on the map above. Hiking South down into Kerrick Canyon gives us access to the Grand Canyon of the Tuolumne River through the junction on the South side of the Kerrick Canyon ford. At the South end of our hike through Kerrick Canyon we will find access Northeast to Twin Lakes over on the East flank of the Sierra from the Seavy Pass junction. Our combined PCT-TYT route travels Southeast from Stubblefield Canyon to the Western end of the segment of Kerrick Canyon we are hiking through. Fording Rancheria Creek we find the trail junction on the South side of the Kerrick Ford to the Grand Canyon of the Tuolumne via Pleasant Valley. While our PCT-TYT route brings us up Kerrick Canyon, the trail on the South side of the Kerrick Ford heads 17 miles South down the mountain to the Grand Canyon of the Tuolumne passing by Pleasant Valley and below Tiltill Valley on its way down. This trail makes possible great loops from Glen Aulin or Hetch Hetchy. Our hike East through Kerrick Canyon ends when we turn Right hiking South to Bensen Lake through the delights of the Seavy Pass Bowl. At the Seavy Pass trail junction the trail also continues Northeast up Rancheria Creek to access the trailhead from Twin Lake off of Highway 395. The trail Northeast up Rancheria Creek opens up the possibility of great loops out of Twin Lakes including the famous Bensen Lake Loop through Kerrick and Matterhorn Canyons out of Twin Lakes. Post up your trip reports here: North Yosemite Backcountry. 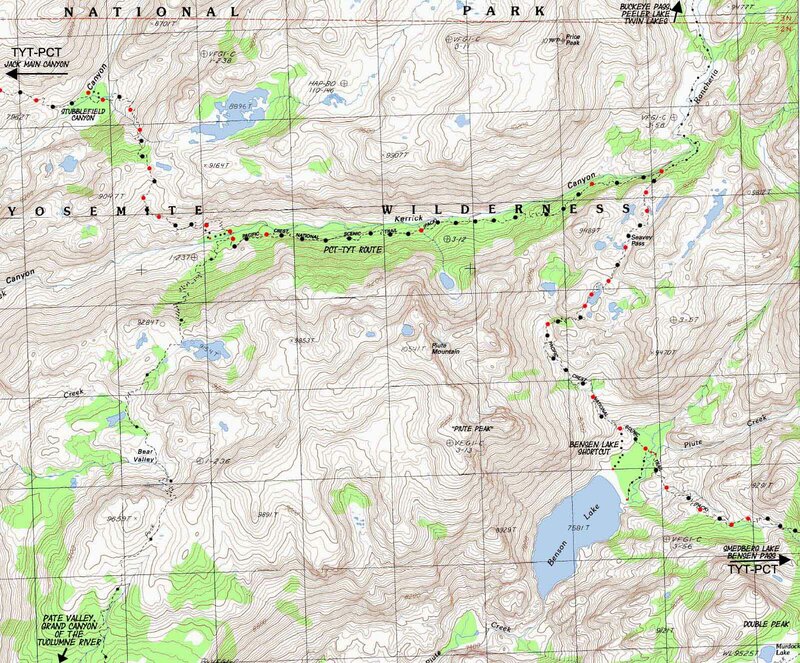 Our Southeastern direction of travel on the unified PCT-TYT route will bring us to Tuolumne Meadows. This 75 mile "section" hike from Kennedy Meadows or Sonora Pass on Highway 108 down to Highway 120 at Tuolumne Meadows is a challenging part of a through hike or a great stand-alone trip on its own. I have not yet written the Yosemite National Parks permit page. But I will offer some advice. Walk into Yosemite. Don't even mess with getting permits there. Want to hike the JMT? Start at Sonora Pass. Drop down to the Valley backwards on the JMT once you arrive at Tuolumne Meadows, then reaccquire the JMT in Lyell Canyon via the Merced River over Voglesang. Yes, I know that may not solve your permit problem. But it is a start. Each square on the map is 1000 yards on a side. I.E. a Kilometer. Physical location: Highway 108 to North, Highway 395 East, and Highway 120 South. Go to the USGS MAP LOCATOR linked to above. Move the Map to the Sierras. Select size of Maps you wish to locate. 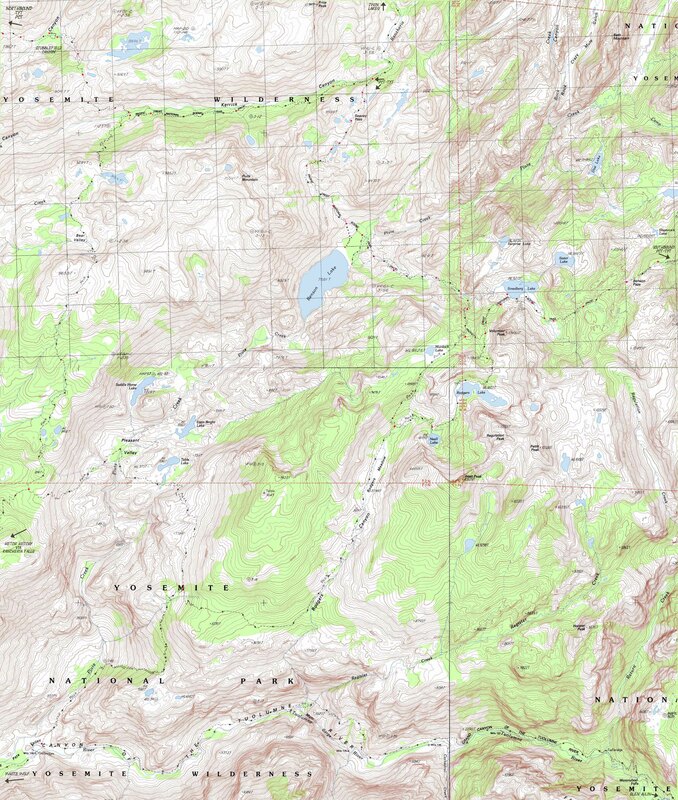 Click "Mark Point" on map to see the USGS maps depicting that grid in the various map scales. To download the map above, locate the Piute Mountain Calif, provisional, 1990, 7.5 minuteTopographic grid square. Then Download it for free. For a broader context of this area in the overall terrain, download the Bridgeport Calif, 1985, 30x60 Topographic.